The University of Tulsa and Oklahoma City University have the highest average net price among private schools. Only two universities have four-year graduation rates of 50% or better. The University of Oklahoma-Norman and Oklahoma State University have the highest average net price among public institutions. Only four universities in the state admit less than 50% of students. Families searching for Oklahoma colleges should start at OKCollegeStart.org which is sponsored by the Oklahoma State Regents for Higher Education. Registered users can create a personal portfolio option under the Your Portfolio option. It has a planner, application, transcripts, email, and calendar sections. The site includes the usual high school planning timeline, requirements for public institutions, and career exploration. Users will also find information on free Summer Academics in Math, Science and Technology. Another site to check out is UCanGo2.org for its student guides and worksheets. These are pretty comprehensive including a checklists by year, college visit checklists, and a Degree vs. On-the-Job Training Chart. The site includes a listing of college fairs in the state. In the resource section, you’ll find a useful list of resources including podcasts, videos, and other websites. Students planning on starting with a community college and transferring should visit the transfer section of the Oklahoma State Regents for Higher Education. Under the information for students section, you’ll find links to a variety of useful websites including the Academic Common Market. There are 26 four-year institutions with 500 or more full-time undergraduates in Oklahoma according to the Integrated Post-secondary Education Data System. Approximately 18 percent of students attend one of the 10 private Oklahoma colleges while 82 percent of students attend one of the 16 state institutions. Private Oklahoma colleges have an average four-year graduation rate of 34.8% and the public universities have an average five-year graduation rate of 28.4%. Four Oklahoma colleges meet the DIY College Rankings 50-50 profile requirements. College-bound seniors in Oklahoma had an average of 20.7 ACT Composite score with a 20.1 for English and 19.8 for Math. The 75th Percentile scores were a Composite of 24, 24 for English, and 23 for Math. A total of 11 colleges ACT 75th% Composite scores were at or above this level. In the following table, the four-year graduation rate is used for private colleges and the five-year rate for public colleges. 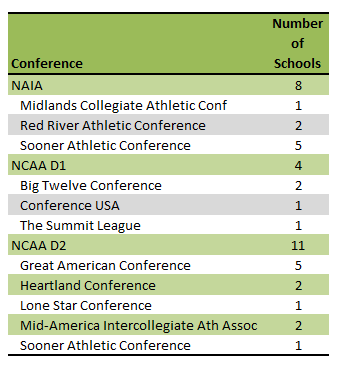 The data are based on the data available from IPEDS in September of 2015 which are available on the DIY College Search spreadsheet.